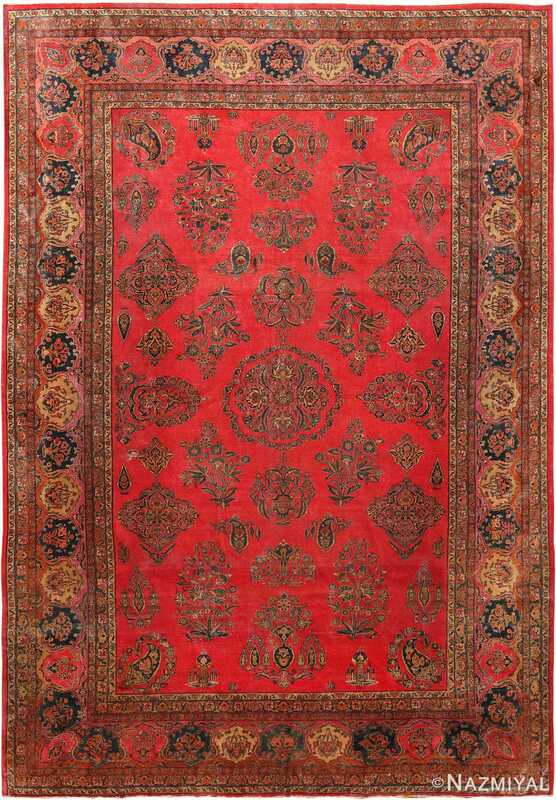 Persian Antique Kashan Rugs are among the very finest Persian rugs and carpets. Kashan was a center of silk production since Safavid times and some of the best classical Persian silk rugs have been attributed to Kashan. 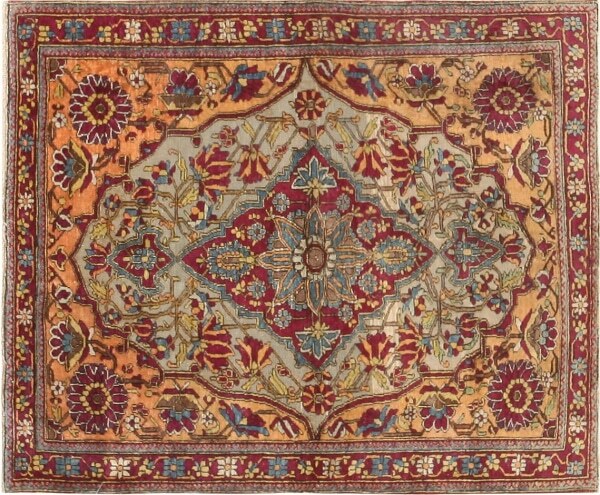 At the end of the nineteenth century the weavers there began to produce high quality rugs and carpets as well, which continued the high standards of design and technique established in the classical era. 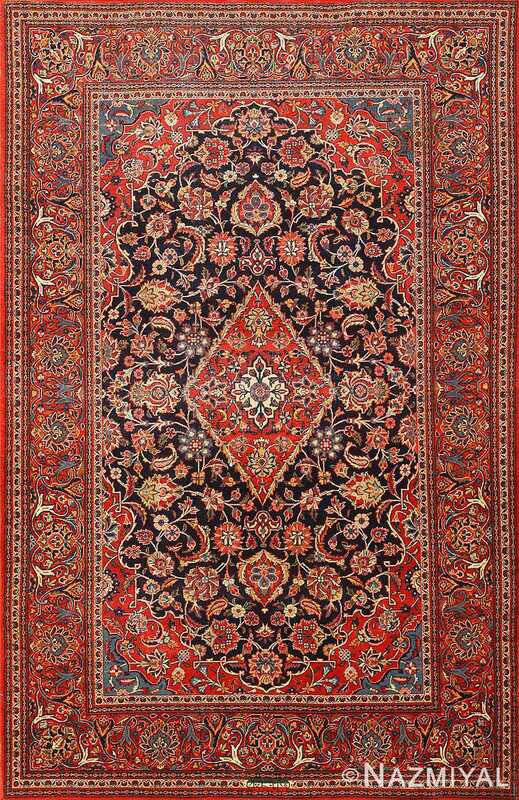 The very best antique Kashans carpets are known as Motashem Kashan. 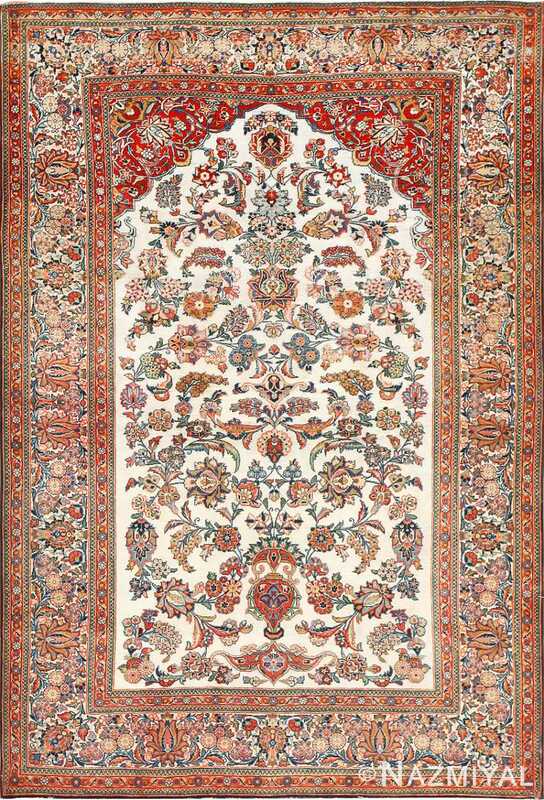 They often have medallion designs, but allover Kashans are not uncommon. The palette can be deep and rich in the classical tradition, or it can utilize softer hues appropriate to modern decor. Though Kashan is now removed from the commercial trade route of Persia, it used to be the largest city in the northwest, and virtually all traffic between Esfahan and the east passed through it. Because of this important location Kashan became the popular stop on a bustling trade route during the Safevid Era. In modern times, nearby mountain ranges prohibit trucks from traveling the route that caravans had so often ventured. During this era in which carpet weaving flourished in Persia, Kashan developed a reputation as one of the finest weaving centers of the east. 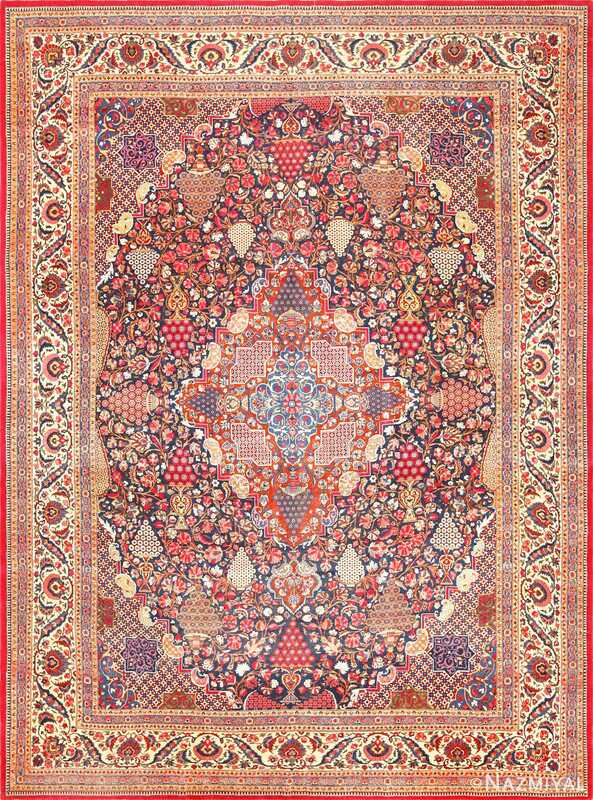 Most books on antique Kashan rugs, its history, its art and its artists, its architecture, ceramics, glass, metals, and its textile art and industry, mention a large number of masters and artists, but with regards to carpets, master weavers and laboratories there are only a few references. Signed carpets, for this reason, also become a key instrument of research. By analyzing the structure and decoration, it becomes possible to establish the characteristics of a specific production type. Once this has been identified, other non-signed pieces can be attributed with certainty. 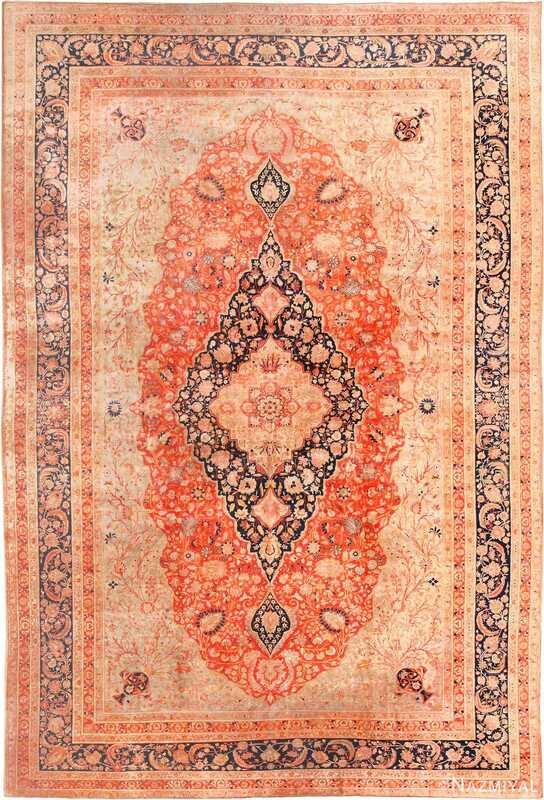 It is using this method that many carpets can be attributed to Mohtasham. 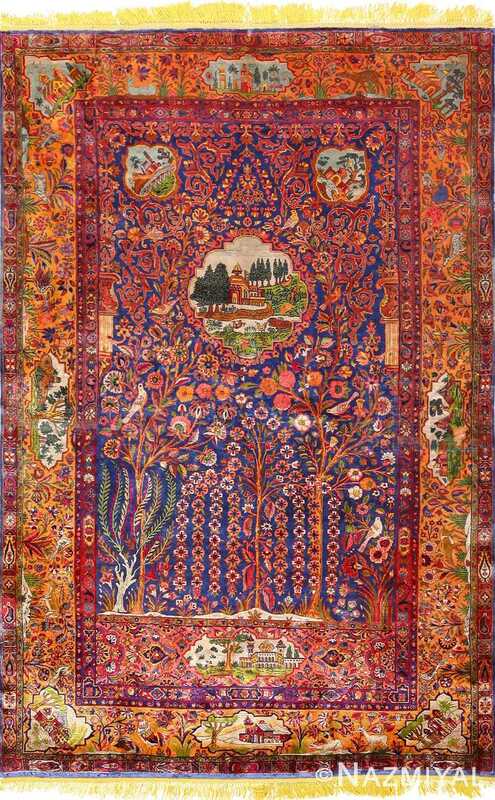 Like the rugs of Isfahan, those produced in Kashan can rightly lay claim to a distinguished weaving tradition going back to the Safavid period, if not earlier. There is evidence that Kashan was an early center of sericulture in Persia, and some of the finest silk carpets of the Safavid period were apparently made there. 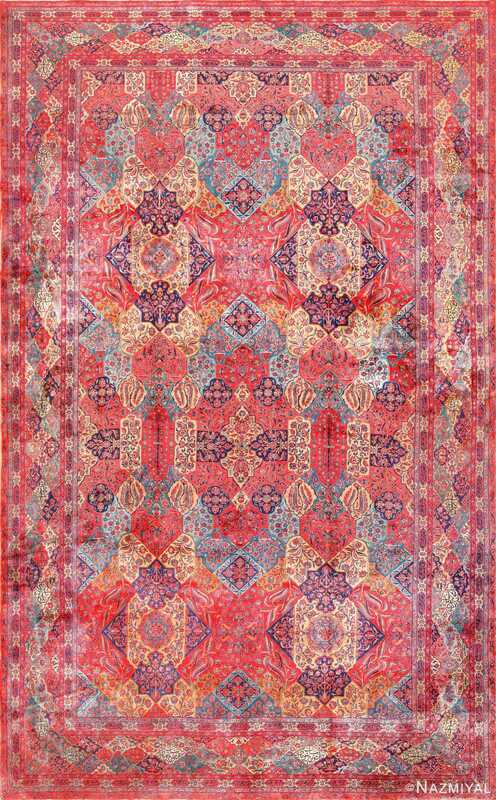 Even today Kashan continues to play a leading role in Persian silk production. 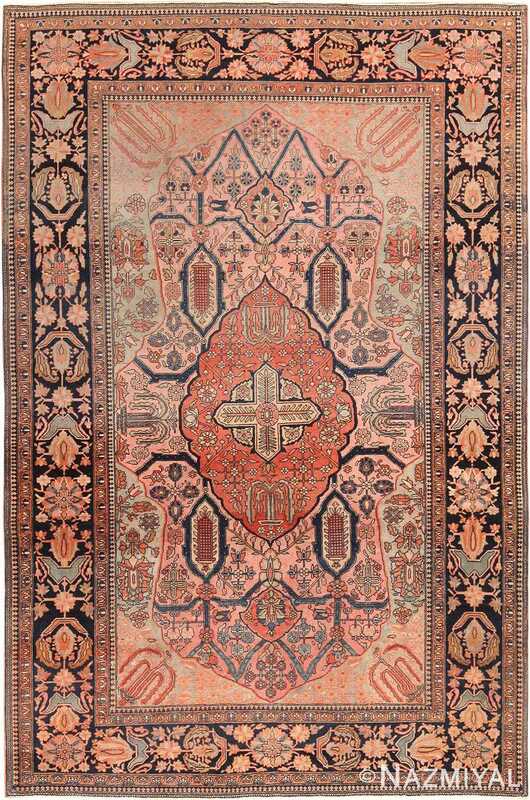 Still, since the late nineteenth century most Kashan rugs are made of wool, although their wool is sometimes known for its exceptional, silk-like softness under the name Motashem. While late nineteenth-century Kashans resembled Sarouks, they were later made with designs in the Kerman tradition. 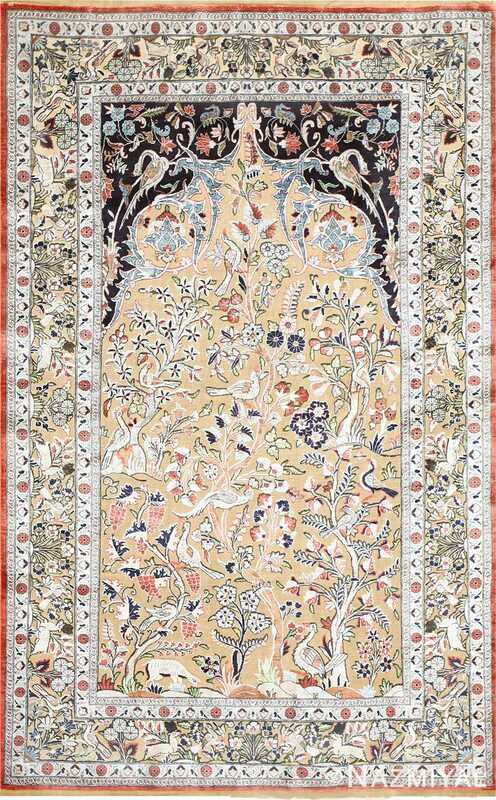 In the last sixty years though, they have become much more closely modeled on classical Safavid carpets, at times using sophisticated pictorial elements. The ‘domestic’ production system in Kashan is also unusual. It is not arranged around large factory workshops employing male weavers, but rather in private homes, where the rugs are woven by women. Kashan, located in the province of Isfahan, Iran, is an oasis village on the western edge of the Great Salt Desert (Dasht-e Kavir). It lies approximately 3000 feet above sea level in the eastern Zagros Mountains north of Kerman. Situated on the edge of the desert, Kashan experiences seasonally intense heat, winds and bright sunlight. It has served as an important political and artistic center throughout the major periods of Persian history and is regarded as a major weaving center for antique Persian rugs. Kashan is known for not only silk and textiles, but for decorative ceramic tiles. 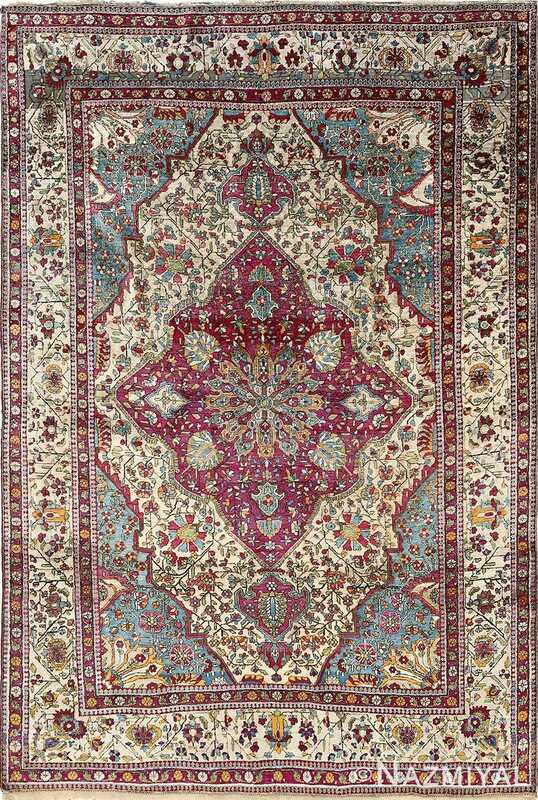 Although carpets are known to have been made in Kashan since at least the Sassanian Empire, 224 to 642 CE, there are two major periods of carpet production. The first was during the Safavid period in the sixteenth and seventeenth centuries in royal workshops and commercial weaving centers. The second was during the late nineteenth and early twentieth centuries under Qajar rule, primarily for export but also for use by the Persian upper class. 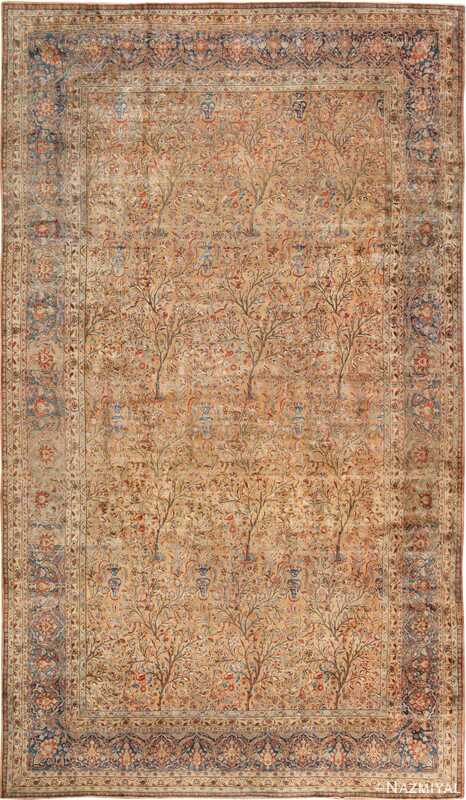 Antique Kashan rugs are a specific antique rug style feature an elongated central medallion with a fully-covered field and corner spandrels. Colors tend to be bright, with fields of blue, red and ivory. 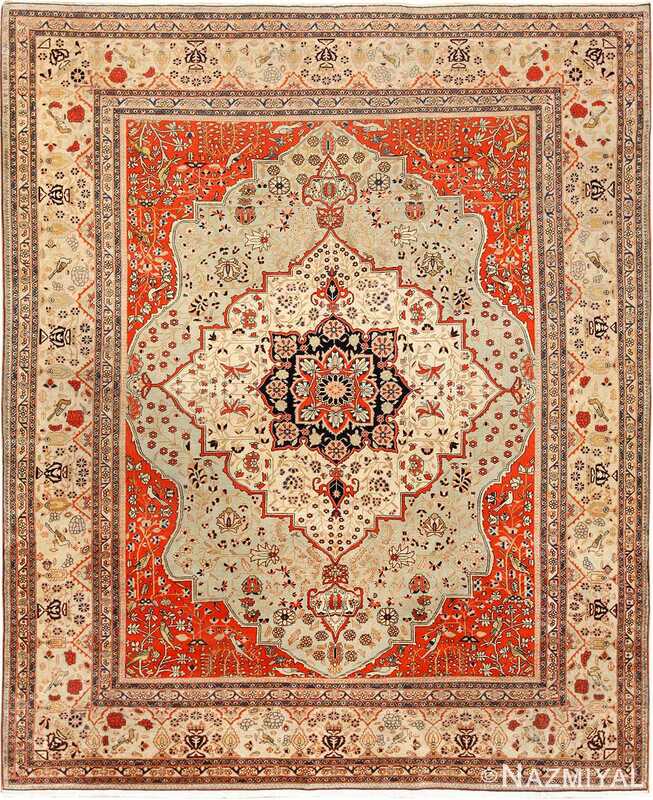 Motifs are densely woven, perhaps the most dense of all the carpet styles. 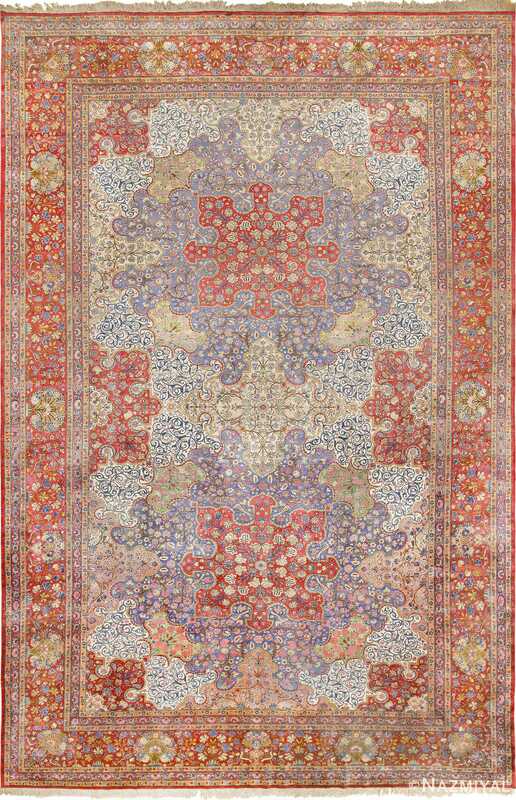 Other styles include all-over patterns with boteh, repeats of floral motifs and vase designs. Borders are often stylized floral motifs of palmettes, tulips, rosettes, vines, scrolls and leaves with a central border flanked by two smaller contrasting bands. The Safavid period is renowned for artistic expression in architecture, manuscript illumination and calligraphy. Detailing on domes and walls of mosques, public buildings and private houses brought a pleasing aesthetic into the interiors, creating a world of gardens, light and sparkling fountains in sharp contrast to the sometimes harsh environment outside. A refreshing interior provided sanctuary from these elements. Safavid ruler Shah Abbas (1571-1629) established the Bagh-e Fin Gardens in Kashan, a spring-fed retreat that brought visual delight and cool relief to the user. These gardens still exist today, nominated as a World Heritage Site. The artistic and cultural conventions of that period were expressed in the weaving of carpets, so the feet walked across lush gardens and the eyes relished bubbling fountains indoors. Kahsan weaving uses the asymmetrical or Persian knot. 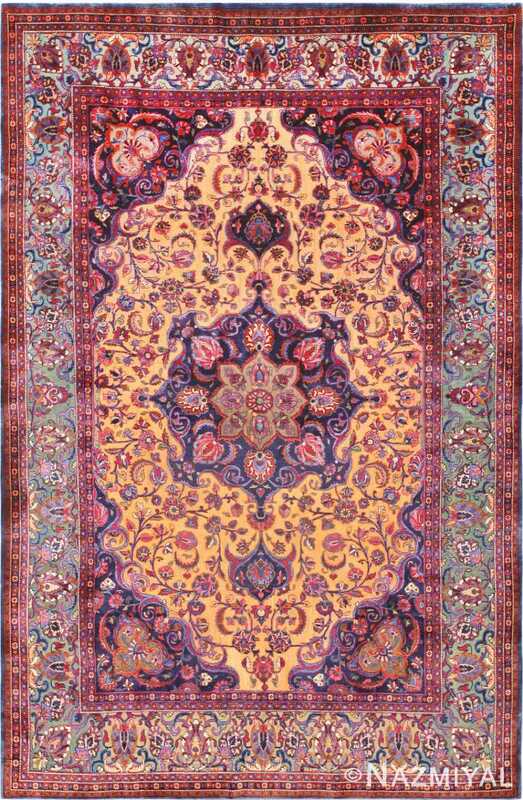 Safavid-period Kashan carpets were often silk, with gold and silver threads woven into the designs. Animal scenes and gardens were popular themes. In the later period, warp and weft were usually cotton. Double wefts create an effect of depressed knots. Pile is usually wool, but silk is also seen. 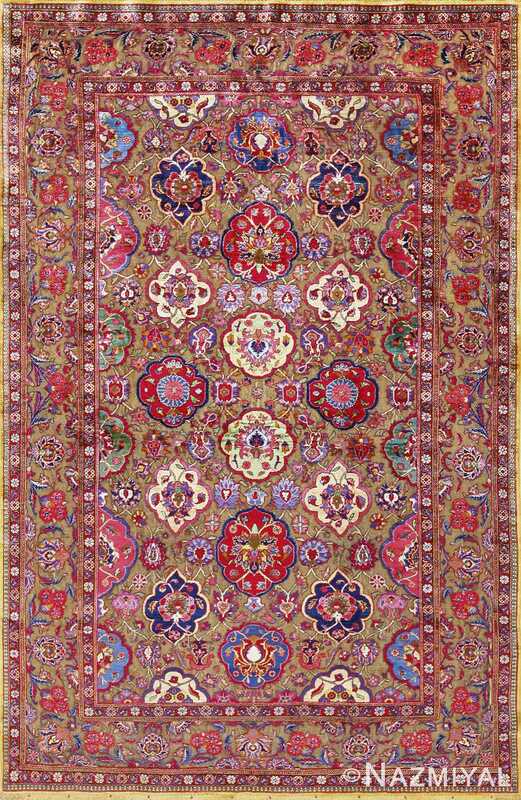 Kashan carpets generally have a high knot count. Prayer carpets were popular during the later period, as were pictorial carpets. 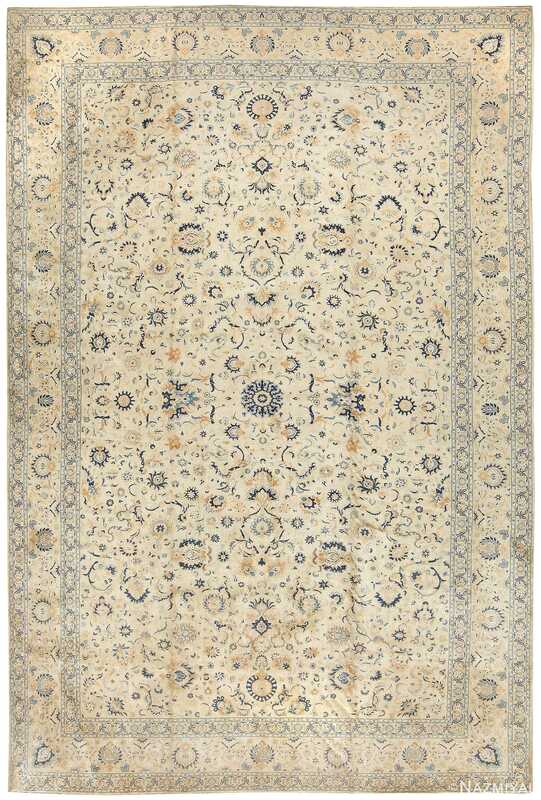 Very fine Manchester wool from Britain, also called Merino wool, was used in the late nineteenth and first quarter of the twentieth century in Kashan carpets. When the wool market collapsed at the onset of the Great Depression, weavers switched to local wools. The quality of Manchester wool allowed a higher knot count and well-executed, crisp motifs in a lustrous carpet with a high pile. 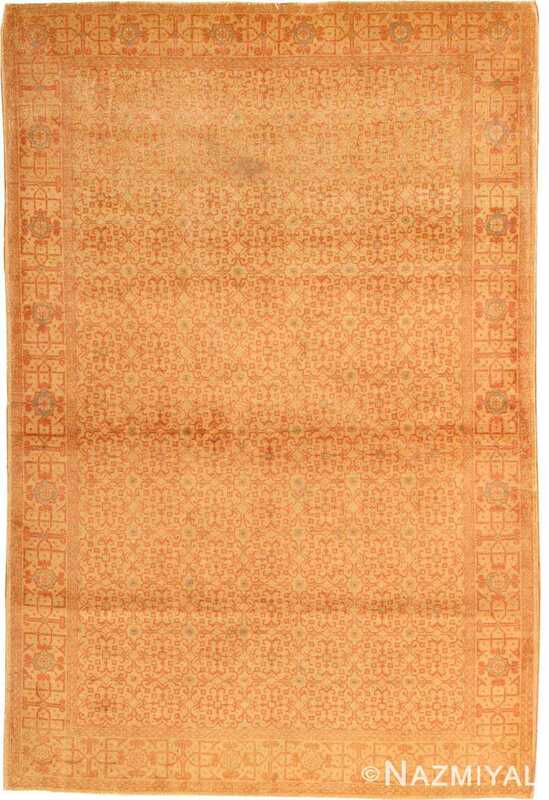 A finely-woven type of carpet, called Mohtashem, was produced in the late 1800’s and early 1900’s. 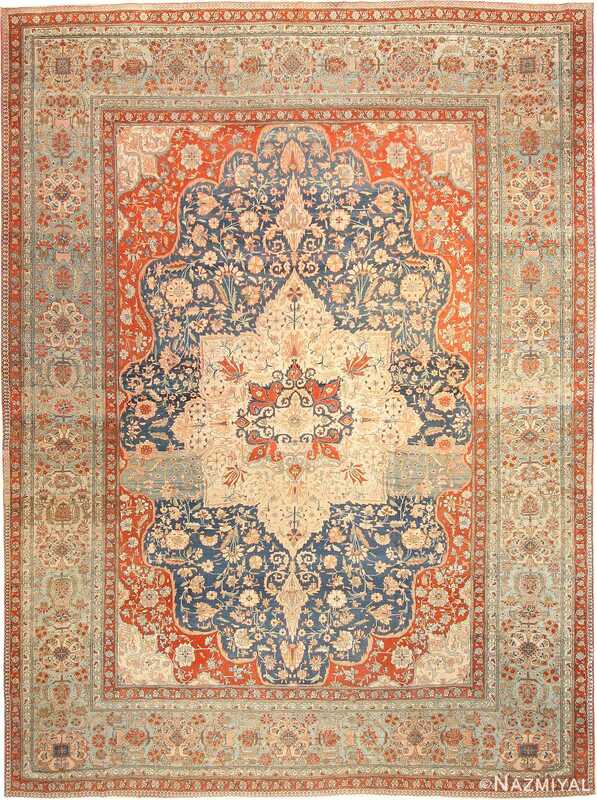 Experts debate whether Mohtashem carpets are the product of a particular workshop or a type produced locally by several weaving centers. Cecil Edwards, representative of the Oriental Carpet Manufacturers in the early 1900’s, attributed them to Haj Mullah Hassan, a merchant in the wool trade in the 1890’s who married a woman from Arak. When the clothing market collapsed, his wife is said to have used the Manchester wool to make carpets with characteristics of the Sarouk style and a knot count often between 200 and 400 knots per square inch. The border of tulip and blossom found on many Mohatshem carpets resembles older Arak rugs, as does the use of lavender in the selvage. 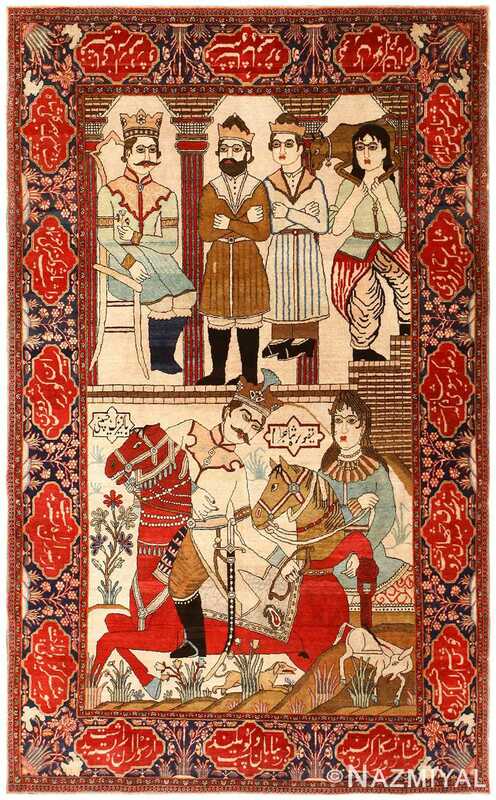 Some carpets are signed as Mohtashem, adding credence to the idea that they were from a single workshop. 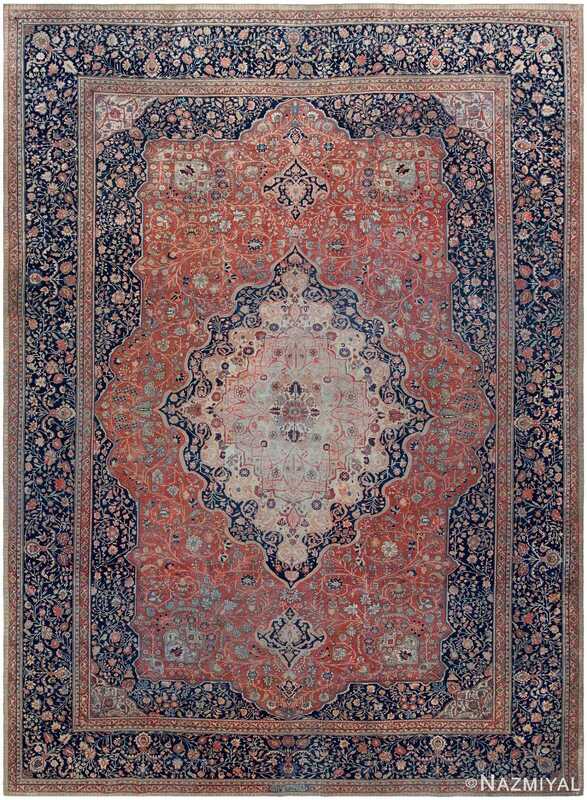 This impressive antique Persian runner, attributed to the legendary Mohtashem atelier, is resplendent with a running series of central medallions. Woven in Kashan, this oversized antique Persian rug features a spectacular medallion composition surrounded by lush arabesques and architectural millefleur borders. *This piece is part of the private collection of Jason Nazmiyal. 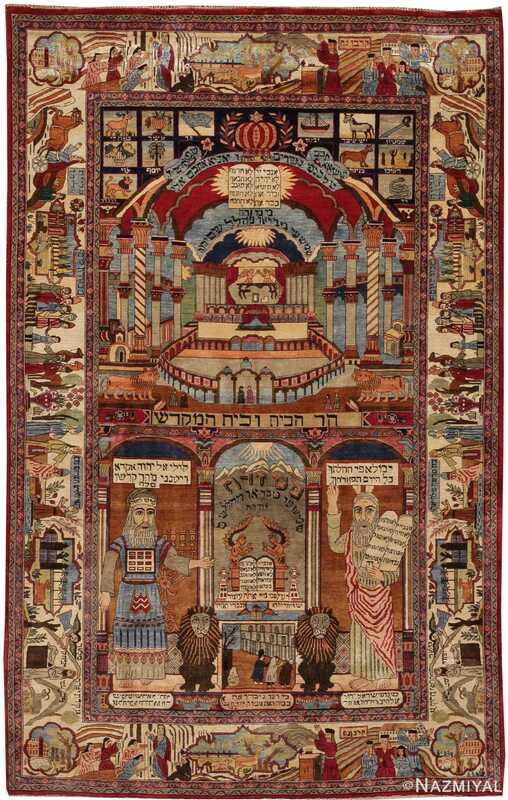 Created circa 1910, this stunning silk rug from Kashan features allegorical scenes depicting Biblical events accompanied by Hebrew inscriptions. 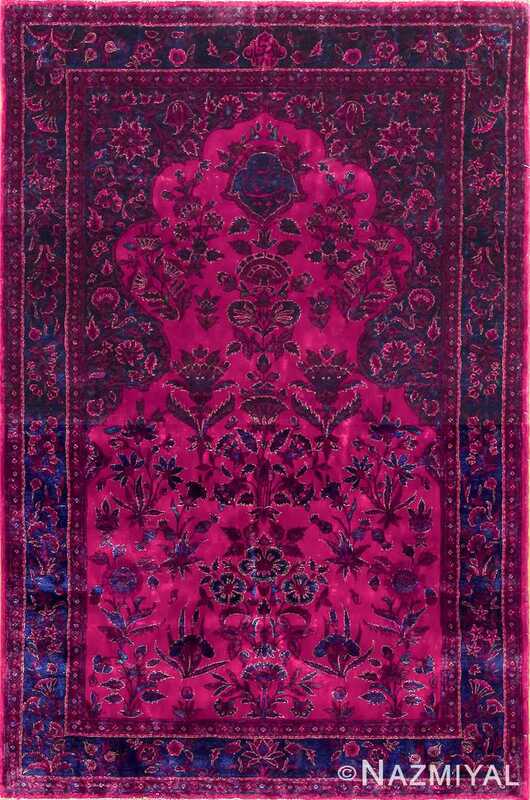 This dazzling antique Kashan rug epitomizes the Souf moniker with its vibrant hues, opulent designs and exceptional dimensionality provided by the luminous fibers. The mysterious geometric designs that spot this piece cause it to resemble an endless labyrinth.